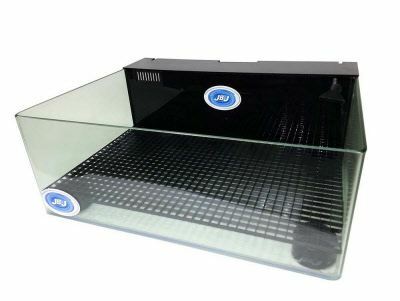 This rimless frag tank features a seamless glass front that offers an attractive panoramic view of your aquarium. It comes with egg crate and feet for growing corals, and it has a lower return nozzle to maximize top viewing. A submersible pump and media sponge are also included in this order. 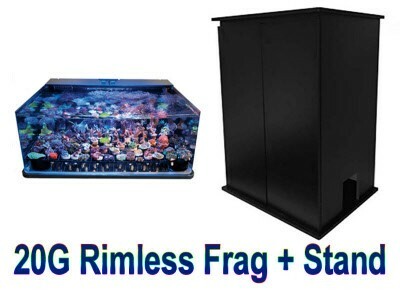 The knockdown stand has double doors and space to store your fish tank accessories. This stand is 36" tall. Most nano tank stands are only 24" to 30" tall. A 36" tall stand is ideal for both viewing and maintenance. Aquarium dimensions: 20" x 24" x 9"
Stand dimensions: 24" x 21" x 36"